On paper, Microsoft’s Surface Studio is the pinnacle of Windows 10 PCs. It’s an all-in-one computer with a touchscreen to make it function more like a giant tablet, and even packs a supplementary ARM processor typically found in mobile devices. Yet despite its modernity, Microsoft still managed to include a nod to the PC’s tradition of DIY upgrades, as recently discovered by iFixit. Not everything can be swapped out—a sad new tradition in the world of PCs. In fact, almost nothing can. But when iFixit ripped apart the Surface Studio in its latest teardown the site discovered the Studio’s onboard storage drives—both the traditional hard drive and the m.2 SSD—were replaceable. The story behind the story: Another interesting thing to note about storage is that the Surface Studio doesn't really have a “hybrid drive,” at least not in the orthodox sense of the term. Traditional hybrid drives are singular devices known as an SSHD, which means the hard drive and flash components both reside inside a single unit. That’s not the case with the Studio. It just has a hard drive with an m.2 SSD stashed in a different location on the motherboard. Nevertheless, you still get the advantage of having a combination of faster flash storage and a high capacity hard drive in the same machine. Replacing the storage components is no simple task, however. Getting at them involves a precarious juggling of the midframe, two fans, a speaker, and a bunch of wires. Unfortunately, onboard storage is where the DIY upgrades end. 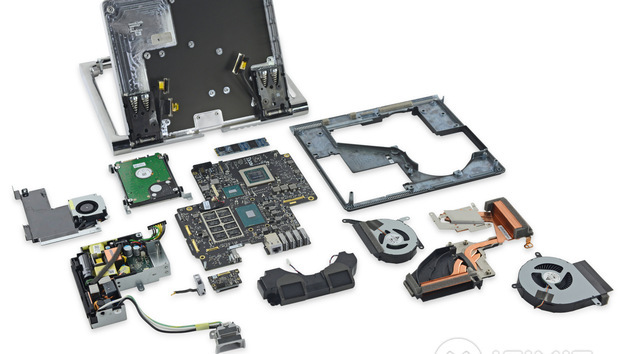 The Surface Studio’s RAM, CPU, and GPU are soldered to the motherboard. There’s also a second part of the motherboard stashed in the display section of the Studio. The most notable feature: iFixit discovered that Microsoft decided to give the display a dedicated 32-bit Cortex M7 processor to help drive its visuals. Microsoft introduced the Surface Studio in October with plans to start shipping the device in early 2017. Then during the week of Thanksgiving, Microsoft surprised early purchasers by letting them know the device would ship that week. If you preorder the device now, however, you’ll be waiting until 2017 as originally planned.